Low back pain (LBP) is one of the most common musculoskeletal problem encountered by a clinician. 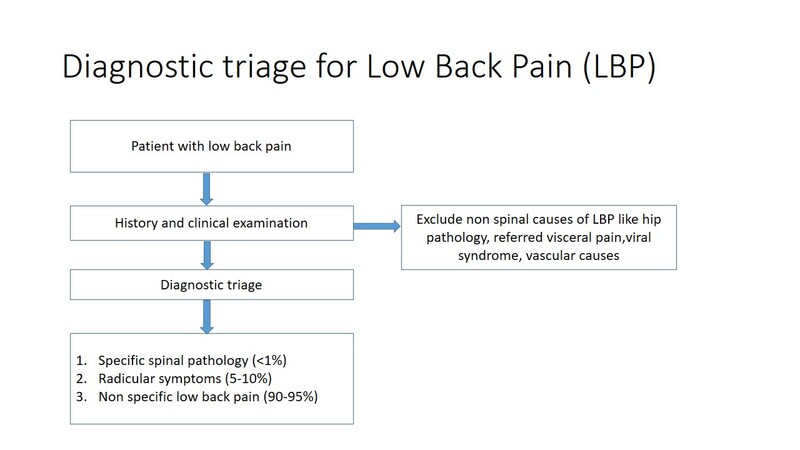 For the purpose of screening and diagnosis of LBP, a diagnosis triage has been proposed for patients when first presenting to a clinician. The initial step is to recognize that the LBP symptom is of specific spinal pathologies or not. This might include vertebral fracture, malignancy, spinal infection, axial spondyloarhritis, cauda equina syndrome. For the patients with suspected specific spinal pathology, the condition itself will dictate the next step. For example, a referral to a neurosurgeon should be done if the patient presents with back pain along with rapidly deteriorating neurological status favoring cauda equina syndrome. Most of the time the specific spinal pathology requires a consultation with a physician and further investigations. The next step is to recognize the features of nerve root involvement. Proper history, clinical features and clinical examination will help to distinguish three subsets of nerve root involvement: radicular pain (sometimes called sciatica), radiculopathy and spinal stenosis. Radicular pain: LBP related leg pain is common. About 60% of patients with LBP reports pain in the leg(s). Cues about the severity, asymmetry and radiating quality of leg pain from the history suggest radicular pain. Positive neurodynamic tests; example, prone knee bend test for upper lumbar roots, or straight leg raise and crossed straight leg raise test for lower roots, are common physical examination signs that guide diagnosis. 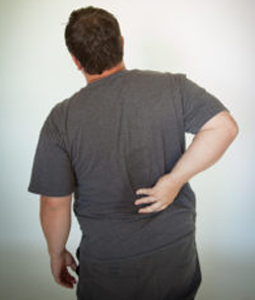 Radiculopathy: Radiculopathy is a sign of nerve root dysfunction. Sensory alteration along the dermatomal distribution and muscle weakness, as well as hypoactive muscle stretch reflex suggests nerve root dysfunction. A single positive symptom or sign of sensory or motor deficit confirms radiculopathy. Spinal stenosis: Spinal stenosis is common in older age group, however, still present in younger age groups. It can be due to degeneration in older patients, or can be either acquired or congenital in younger age group. One of the key clinical feature of spinal stenosis is neurological claudication. Neurological examination is often normal. Non-specific low back pain (NSLBP) is the third triage group and represents 90-95% of patients with LBP. It is diagnosed by excluding the first two categories i.e. specific spinal pathology and radicular symptoms. There is no specific identifying features for NSLBP. NSLBP is managed conservatively, mostly by physiotherapists, and diagnostic imaging (such as x-rays and MRI) are not recommended. Watch out for future posts on further details of NSLBP and its management. I am Bandana Gautam. I have completed my Bachelor of Physiotherapy (Honours) degree from Kathmandu University School of Medical Sciences, Dhulikhel, Nepal. 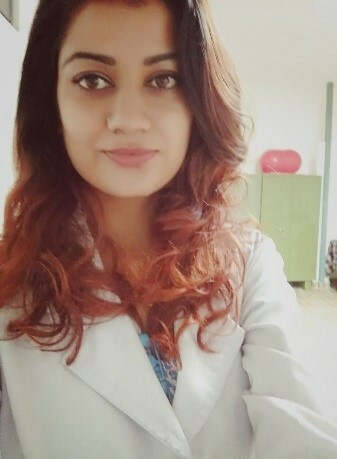 I have worked as a physiotherapist in both clinical and rehabilitation setup. My interest in research has now driven me to work in a low back pain study as a Research Assistant. Apart from my clinical and research work, I enjoy reading novels and playing sports (mostly table tennis and basketball). My further goal in life is to pursue a higher degree in physiotherapy. I want to become a good physiotherapist and a physiotherapy teacher.